In 2015, the Centers for Medicare & Medicaid Services (CMS) introduced the Medicare Care Choices Model (MCCM), which provides a new option for Medicare beneficiaries to receive hospice-like support services from select hospice providers while receiving curative treatment at the same time. Because of our near 40-year commitment to expert care, quality and compassion, Cedar Valley Hospice was selected from hospices nationwide to participate in the second phase of the Model in 2018. The patient's primary physician continues to direct patient care in conjuntion with the Cedar Valley Hospice interdisciplinary team. The intention of MCCM is to enable patients with proper eligibility to be able to benefit from hospice services earlier in the advanced illness process. The Model allows for more patients and families to get the support they need. If you know someone who may benefit from this new program, please call us at 319.272.2002. 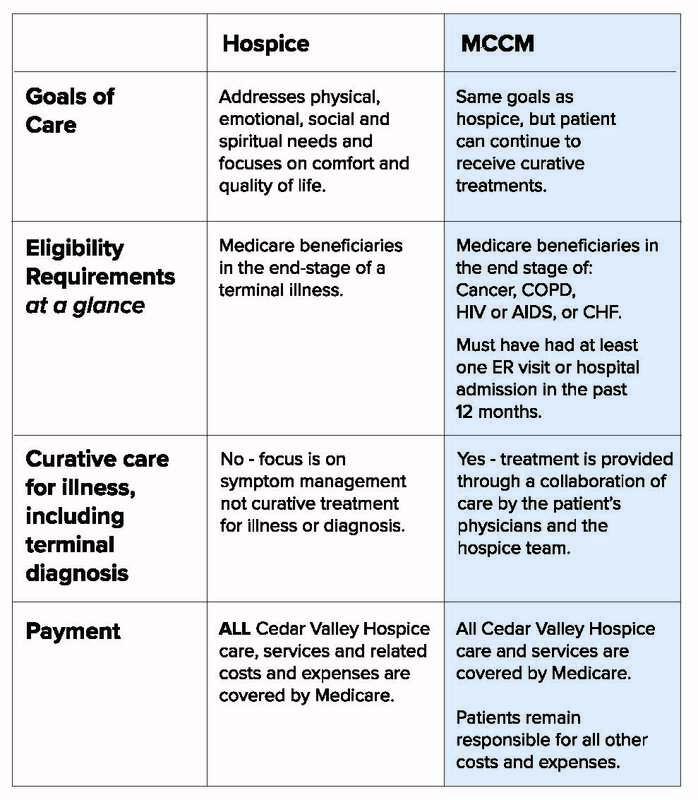 The Medicare Care Choices Model (MCCM) encompasses all aspects of care - palliative care, end-of-life care, hospice support services and traditional health care. It allows individuals the ability to receive expert symptom management and supportive services while continuing the receive treatments for a life-limiting illness. Who is in charge of medical care? The patient's primary physician continues to direct patient care in conjuntion with the Cedar Valley Hospice Interdisciplinary Team and other non-hospice providers if necessary.